Night Raids: Disrupting or Fueling the Afghan Insurgency? 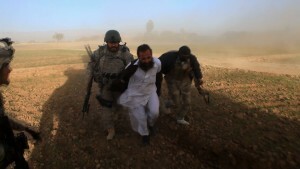 The signature tactic of the U.S.-led kill/capture campaign in Afghanistan, “night raids” against suspected Taliban leaders are touted by the U.S. military as one of the most effective means of putting pressure on the Taliban. During these operations, units under the Joint Special Operations Command (JSOC) search private residences — based on intelligence or tips — for suspected insurgents. · Between December 2010 to February 2011, nearly 20 night raids were conducted each night — about 600 per month. · ISAF says that in 80 percent of recent raids, no shots are fired. Botched night raids and harrowing accounts from Afghan citizens have raised serious questions about the precision of intelligence and the rate of civilian casualties. Last year the Times of London exposed a horrifying night raid gone wrong in which Afghan investigators found that Special Forces dug bullets out of the bodies of two pregnant Afghan women in an attempted cover-up. Night raids are also controversial because they violate Afghan cultural norms. Tactics that are considered particularly offensive include troops entering a home where women are present or using dogs (which are considered impure) in their search. Afghan President Hamid Karzai has long opposed the raids, calling for their end altogether. In November 2010, he told The Washington Post that the raids were an affront on the sanctity of Afghan homes and further fueled the insurgency. “The Afghan people don’t like these raids,” he said. “If there is any raid it has to be done by the Afghan government within the Afghan laws.” This past March, the accidental killing of Karzai’s cousin in a night raid further escalated tensions. Earlier this year, the Afghanistan Analysts Network, an independent think tank in Kabul, concluded that: “On the ground, and in the minds of the Afghan public, night raids remain lethal, feral, and absurdly imprecise.” And a 2010 report from the Open Society Institute identified due process problems and a “lack of accountability” for night raids gone wrong. Because the operations are conducted outside the NATO chain of command, the detention process is less open to public scrutiny. The directive also stresses the importance of coordinating the operations with Afghan soldiers. As Gen. Petraeus tells FRONTLINE, Afghan soldiers now lead the “call-outs” when forces announce themselves before entering homes. U.S. Army Lt. Gen. David Rodriguez told FRONTLINE that night raids are assessed very carefully to “ensure that the cost-benefit is worth the pain and agony of the Afghan people.” He added, “The payoff has been worth it in many cases.” And some statistics indicate the situation may be improving: Civilian deaths in coalition operations have declined in the last year according to the U.N. mission in Afghanistan, though these statistics have come under criticism for reporting only a portion of civilian deaths from U.S. raids.